Having spent the better part of his life helping people, first as an emergency service responder and now as an ambassador for the Multiple Sclerosis Society of Canada, Orangeville council candidate James Jackson hopes to be afforded the opportunity to put his skills to the ultimate test in October’s municipal election. The long-time local resident, who filed his nomination papers on June 6, says he hopes to make a difference in the community he calls home. A self-described jack-of-all-trades and master of none, Mr. Jackson will look to use the experiences he’s had over the course of his life to develop his own unique style of serving on council. 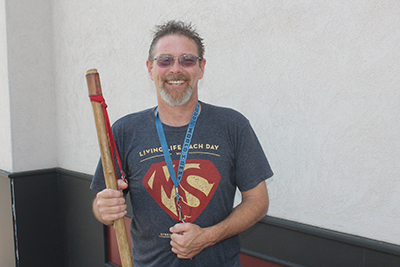 Following a lifetime of work experience, Mr. Jackson was hit with what he called a triple whammy over a two-year period, starting in 2012 when he broke his back at his workplace. He was let go from his job and left to claim a disability cheque from the government. After slowly getting back on his feet, getting a job at Tim Horton’s, James’ support pillar came crashing down when he lost his mother on Jan. 31, 2014. That loss was further compounded by his diagnosis of Primary Progressive Multiple Sclerosis (PPMS) just two months later. While life was clearly dealing him a duff hand, he didn’t let it affect his attitude and overall frame of mind. That was how the opportunity with the MS Society came about. Now four years into that role, he is excited about the possibility of becoming part of Orangeville’s next council. “I want to bring a sense of civility, sense of reasoning and just overall common sense to council chambers. I have an open mind and ability to think outside the box. I think that’s something we desperately need after this most recent term of council,” Mr. Jackson said. He condemned what he perceived as the “elitist attitude” of some members, stating it’s time for Orangeville to get “back on track”. He wants to promote a sense of fiscal responsibility, with members mindful of excessive tax increases, some of which in recent years, Mr. Jackson says, have resulted in friends and acquaintances being forced out of the community because they can no longer afford a bloated tax bill alongside mortgage and utilities. Having been a regular fixture on social media for some time, Mr. Jackson says he is aware of the fact that there are some in the community who see him as a joke, not befitting of a place on council. To those individuals, he simply says, “Fine, don’t vote for me.” To those willing to give him a chance and listen to his platform, he hopes to do enough over the coming months to earn a vote. Regarding some of the hot button issues, Mr. Jackson said he is a huge supporter of the Orangeville Police Service and would not entertain another OPP costing proposal. “Listen, the province is losing money. I think it’s going broke. Eventually, the province is going to look at ways to collect money off people. Who is the boss of the OPP? Who is in charge of the costing formula for the OPP? I believe, if we switch, this is going to end up costing us a lot more money,” Mr. Jackson said. He admits the community will have to find the funds to pay for a new fire hall in the near future. When that eventuality comes about, he would like to see Orangeville open up its own museum, completely separate from the Museum of Dufferin, at the current fire hall on Dawson Road. He also talked about the possibility of introducing a community lottery or 50/50 to bring the double benefit of giving the public something to look forward to and the municipality an additional revenue stream. The big thing he’d like to instill should he be successful in his bid is a sense of togetherness at council.